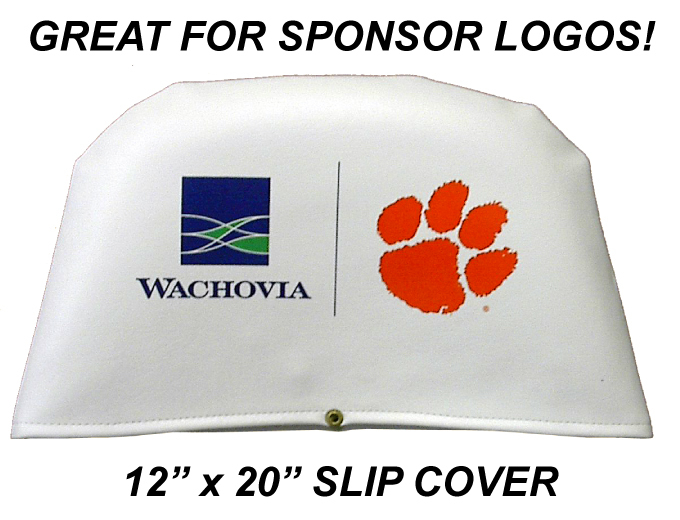 Slip Covers for the top of your exisiting or new chairs are a great way to advertise for your teams sponsor! Available with grommets, snaps, or plain, Slip Covers are a cost effective way to get your sponsors name or message across. They can be printed on one side or both sides! And, you can put different logos on each side. They are available in any of our stock colors, and priced to fit any budget. Give us a call to find out more. So if new Chairs for Athletic Events aren’t in the budget this year, or new Sideline Chairs, Logo Slip Covers are a great alternative to consider.